Though firms may worry about profits now that Trump's decision to let the world boil in its own juices rather than offend the hydrocarbon lobby (Coke may run out of water, Disney may run out of themepark-goers), the latest report from UK nonprofit Carbon Disclosure Project shows that companies are also privately exulting in the new possibilities opened up by climate catastrophes and the ensuing hidden misery. 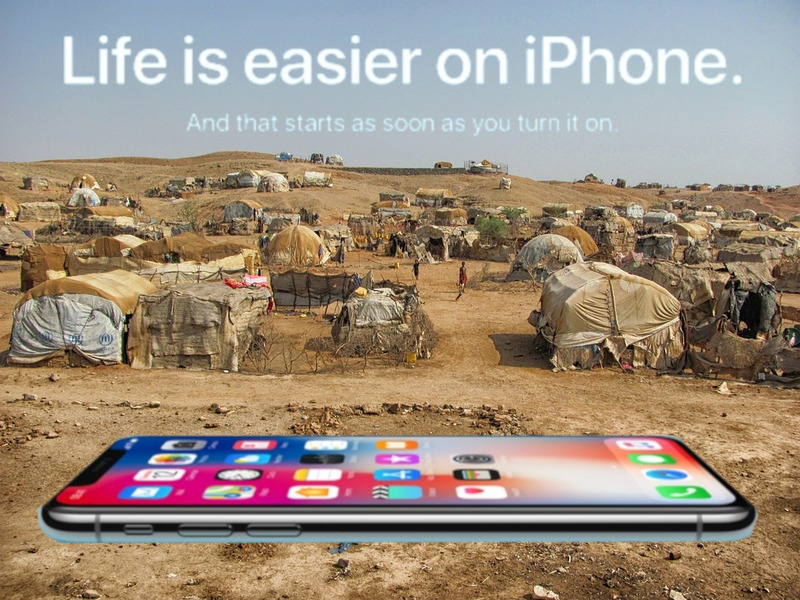 For example, Apple speculates that people caught in disasters or forced to live in refugee camps will love their Iphones: "As people begin to experience severe weather events with greater frequency, we expect an increasing need for confidence and preparedness in the arena of personal safety and the well-being of loved ones. [Iphones] can serve as a flashlight or a siren; they can provide first aid instructions; they can act as a radio; and they can be charged for many days via car batteries or even hand cranks." Wells Fargo looks forward to continuing its criminal and predatory financial practices by extending credit to people whose homes are damaged or demolished by floods, fires, etc: "Preparation for and response to climate-change induced natural disasters result in greater construction, conservation and other business activities. [Our company]has the opportunity to provide financing to support these efforts." Home Depot predicts soaring demand for construction supplies in the wake of disasters and more air conditioners and fans as temperatures rise: "[We will see] higher demand should temperatures increase over time." Google thinks that Google Earth will grow along with curiosity about disasters around the world: "If customers value Google Earth Engine as a tool to examine the physical changes to the Earth’s natural resources and climate, this could result in increased customer loyalty or brand value. This opportunity driver could have a positive impact on our brands." If you're an American 65 or older, there's a 20% chance that you're working or looking for work (the chance jumps to 53% if you attained an undergrad or more advanced degree): that's double the rate in 1985. The last time it was this high was 57 years ago, in 1962.